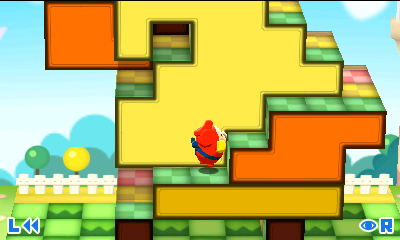 Mallo is visiting Pushmo Park, where Papa Blox has set up his most daunting Pushmo puzzles. However, a mean kid has trapped the other kids on the structures, so Mallo agrees to climb up and rescue them. 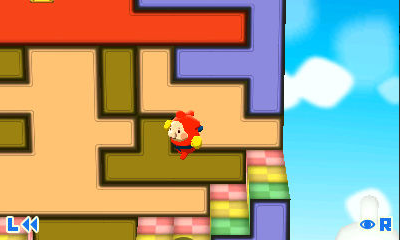 Each Pushmo puzzle is a large structure made of blocks of color. Each block can be pulled out up to three places, either from the front or from the side if space allows. As Mallo climbs larger structures, he may have to use Ladders or Switches to progress. When Mallo reaches the trapped kid, the puzzle is completed. You can design your own Pushmo puzzles and exchange them using a QR Code. Several of the puzzles in the game are based on Nintendo characters and systems. The Nintendo Mural set exclusively features puzzles based on NES sprites, and its icon is a Famicom cartridge.